Remember your mother, aunt, grandmother or best friend on their special day with an unforgettable, heart-shaped gift. 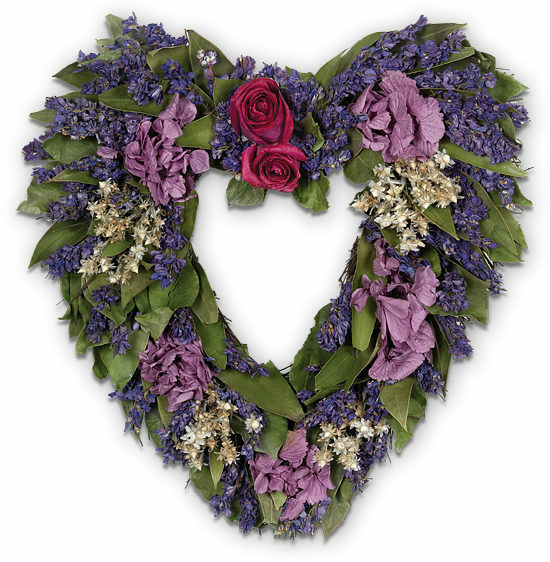 Created exclusively for Calyx Flowers, our wreath is shaped by hand from natural twigs and woven with a wonderful profusion of purple, lavender and green. A preserved pair of flawless purple roses is prominently displayed amongst a bed of natural leaves, lavender larkspur, natural ammobium, and lavender hydrangea. The heart arrives ready for immediate enjoyment. Our preserved designs are originally produced with extra elements so slight shedding during transit is normal. The colors will soften naturally over time. The designs are best maintained when displayed indoors, away from direct sunlight, strong heat sources and extreme moisture. Please note: outdoor display is not recommended.